Mamah Borthwick and Edwin H. Cheney Residence, Oak Park Illinois (1903 - S.104). Set of twenty B&W images photographed on February 11, 1972. Unity Temple, Oak Park, Circa 1974-1978 (1904 - S.096). Set of 2 color transparencies of Unity Temple. Detailed view of the concrete column. Wright designed the Unity Temple in 1904. Text printed on sleeve: "E-1 Concrete Column Decoration. Oak Park, IL. 1904. 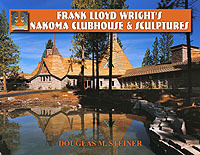 Frank Lloyd Wright Archt. 11HS-26." Text printed on verso: "Quality Slides by Curt Teich & Co. Creators of Curteichcolor 3-D Post Cards." Original 35mm color transparency slides. Aline Barnsdall Residence A, 1975 (1917 - S.208). Set of three 35mm Color Kodachrome slides. Viewed from the Southwest. The Dining Room and main entrance is on the far left, the Kitchen is in the center, Bedrooms on the right. Residence A is one of two surviving structures on Olive Hill designed by Frank Lloyd Wright for Aline Barnsdall. It was completed in 1920. By 1965, changes were made to Residence A by the city of Los Angeles. The original Living Room�s North balcony was removed and replaced with a wooden one. Exterior stairs and a doorway in the foreground were added, leading to the second floor. The road, sidewalk and retaining wall in the foreground were also an addition. The sidewalk and retaining wall has since been removed. Similar view from 1923 in "Frank Lloyd Wright, Hollyhock House and Olive Hill," Smith, 1992, p.158. Stamped on face of sleeve: "15. May 75." Printed on verso of sleeve: "Kodachrome Transparency. Processed by Kodak." Set of three 35mm slides taken in May, 1975. 10 x 7 High Res digital image. Charles Ennis Residence, Los Angeles, 1975 (1923 - S.217). Set of Six 35mm Color Kodachrome slides. Viewed from the Northwest. Frank Lloyd Wright designed four textile block homes in Los Angeles. This was his last and largest of the four. When you include the chauffeur�s quarters, the home encompasses approximately 6,200 square feet. The home was constructed of more than 27,000 concrete blocks, all made by hand on site. The main house includes a large Living and Dining Room, Kitchen and three bedrooms. Viewed from the street, the Entrance is in the center, the Kitchen is on the right, Dining and Living Rooms in the center, and Bedrooms to the far left. Stamped on face of sleeve: "28. May 75." Printed on verso of sleeve: "Kodachrome Transparency. Processed by Kodak." Set of six 35mm slides taken in May, 1975. 10 x 7 High Res digital image. Fallingwater 1975 (1938 - S.231). Set of 20 - 35mm Slides photographed in 1975 by Harold Corsini for the Western Pennsylvania Conservancy. Although not dated, the same images were published as a set of postcards by the Conservancy and dated 1975. A valuable record of Fallingwater in 1975. 1) View of the lower Bear Run which meanders through the 1500 acres at Fallingwater. Stamped on face: "Fallingwater 1. Lower Bear Run. Western Pennsylvania Conservancy." 35mm slide mounted in plastic sleeve and 11.5 x 8 high res color digital photograph. Richard Lloyd Jones Residence, "Westhope" built for Wright's cousin Richard Lloyd Jones in 1929, Tulsa, Oklahoma (S.227). This set of five photographs were used in publishing �GI 9: Global Interior #9: Houses by Frank Lloyd Wright 1" Futagawa 1975, pages 176 - 181. Taliesin West 1975 (1937 - S.241). Set of 4 - 35mm Slides. 1) Frank Lloyd Wright�s Office viewed from the East. The Cabaret Theater is to the right. The fountain in the foreground was added in 1956. Photographed by Elizabeth H. Dull, PhD., during November 1975. 2) View of the Drafting Studio from the Northwest. The Pergola and walkway are on the left, the lawn and pool are on the right. Wright added a concrete vault on this end of the Drafting Studio and a fireplace on the other end. Constructed of desert masonry. Forms were constructed and filled with local rocks and boulders. Concrete was then poured into the forms. Twin sets of pattered poles decorate either end of the Drafting Studio. Photographed by Elizabeth H. Dull, PhD., during November 1975. 35mm slide and 11.5 x 8 high res color digital photograph. Mrs. Thomas Gale Residence Circa 1976 (1904 S.098). Viewed from the Northeast. Frank Lloyd Wright designed the Gale Residence in 1904, but construction did not take place until 1909. This design is dominated on the North elevation by the large walled terrace on the ground level, the cantilevered balcony on the second floor and cantilevered roof over the balcony. 35mm slide and 11.5 x 8 high res color digital photograph. Robie House 1976 (1906 - S.127). Set of 12 Kodachrome slides taken in July 1976. 1) Robie House sign: "Chicago Landmark. Frederick C. Robie House, Frank Lloyd Wright, architect, 1909. Robie House combines all the elements of Wright�s mature style. It is his boldest example of a Prairie house designed and one of the most significant buildings in the history of architecture. Designated a Chicago landmark on September 15, 1971, by the City Council of Chicago. Richard J. Daley, Mayor. Commission on Chicago Historical and Architectural Landmarks. Robie House. 5757." 35mm slide and 11.5 x 8 high res color digital photograph. Frank Wright Thomas Residence 1976 (1901 - S.067). 1) Viewed from West. Hand written on slide: "Wright, F. L. Frank Thomas House, Oak Park, 1901." Stamped on slide: "May 76." 2) Viewed of the porch ceiling. Hand written on slide: "Wright, F. L. Frank Thomas House, 1901." Stamped on slide: "May 76." Acquired from the estate of Elizabeth H. Dull, PhD. 35mm slide and 11.5 x 8 high res color digital photograph. Fallingwater 1977 (1938 - S.230). Set of 4 - 35mm Slides. 1) Fallingwater viewed from the East, from the road across the stream. Designed by Frank Lloyd Wright in 1935, the house is cantilevered over the stream. In 1963, Edgar Kaufmann Jr. donated the property to the Western Pennsylvania Conservancy. Hand written on slide: "Wright, F. L. Fallingwater. Bear Run, Pa. Falls." Stamped on slide: "Aug 77." 2) Fallingwater stairs, pool and stream. The stairs lead from the living room, down to the stream bed. The pool is in the background, "Mother and Child," the bronze sculpture setting on the ledge of the pool, was created and cast by Lithuanian-born American sculptor Jacques Lipchitz circa 1941-1942. The 50"x47" bronze sculpture depicts a mother, with a child hugging her back, looking to the sky with raised arms. Designed by Frank Lloyd Wright in 1935, the house is cantilevered over the stream. In 1963, Edgar Kaufmann Jr. donated the property to the Western Pennsylvania Conservancy. Hand written on slide: "Wright, F. L. Fallingwater. Bear Run, Pa. Stairs and Pool." Stamped on slide: "Aug 77." Acquired from the estate of Elizabeth H. Dull, PhD. 35mm slide and 11.5 x 8 high res color digital photograph.